Welcome to the 125th edition of Date Night! To celebrate the occasion, we head to the Old Fourth Ward to visit a restaurant that just made the Eater Atlanta Essential 38. Is the pizza at Ammazza as good as Antico or Double Zero? Let’s get inside and find out. 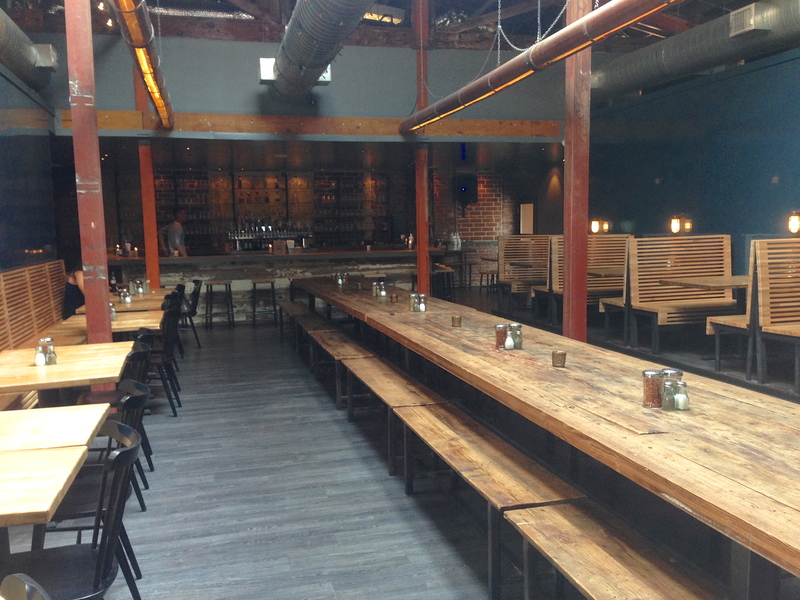 Ammazza is located inside an old warehouse-type building. 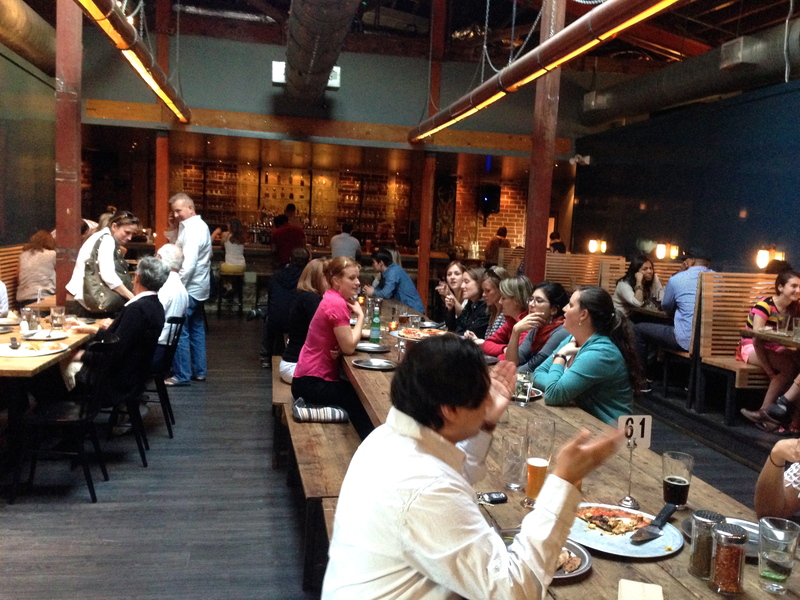 They have done a great job fixing the place up, with a patio, a nice bar, and two Italian pizza ovens. Because it’s less than 2 miles from our work location, we arrive pretty early and have the place to ourselves. You order in the front before you sit down. Because it’s so early, we order beers and a salad before coming back to order our pizza. They have 17 beers on tap tonight. It’s a very nice list, but they don’t tell you how much you get in a pour. They should modify their beer list to do so because each beer comes in its own glass to match the brewery. That’s a really nice touch, especially for pictures. As you can see, I got a Clown Shoes Chocolate Sombero. It’s an 9% imperial stout with flavors of chocolate and coffee. Our official Date Night photographer didn’t figure out the glass thing until later, which is why you will notice that most of the beer is gone in the next photo. Eve orders a Wild Heaven Ode to Mercy brown from right down the road in Decatur. 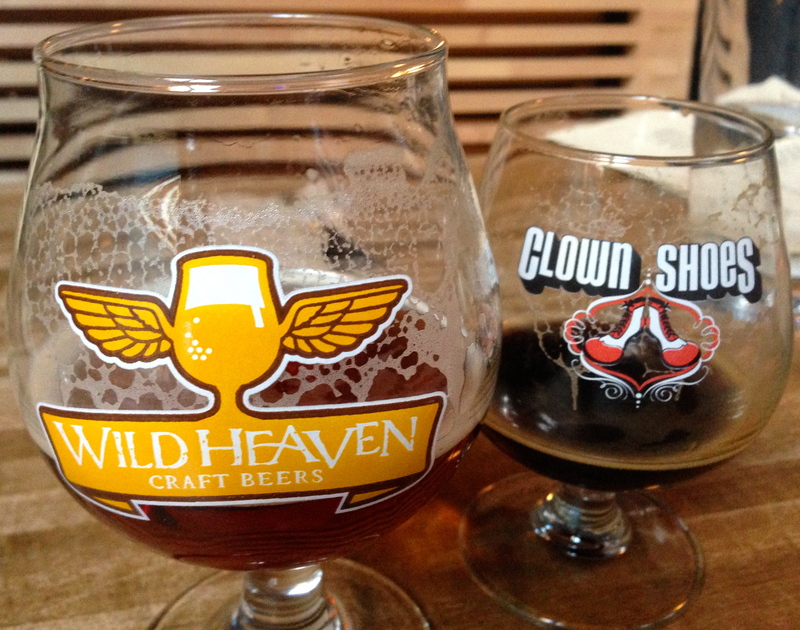 It’s got a lot of coffee in it too, and because it’s 8.2%, it comes in a much bigger glass. 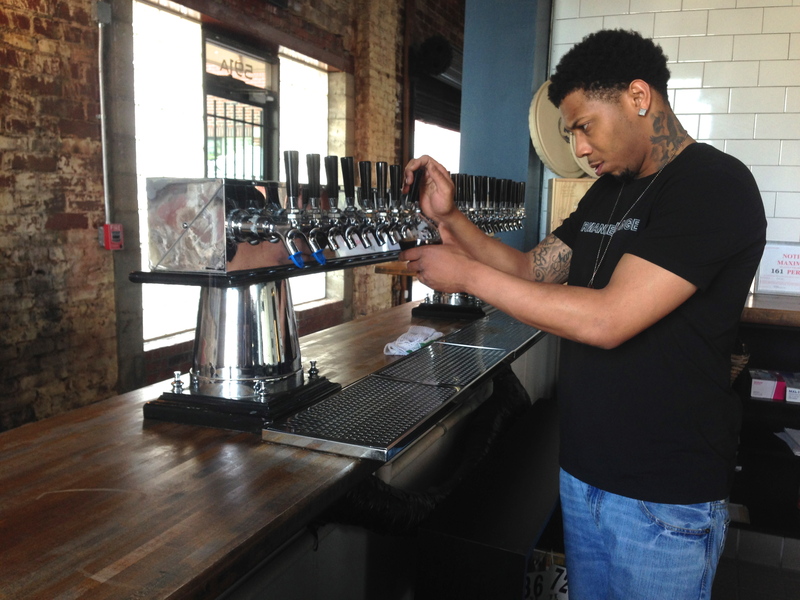 See what we are talking about with pour sizes? Our Caesar salad arrives shortly after we pick a booth. Look at us eating healthy! 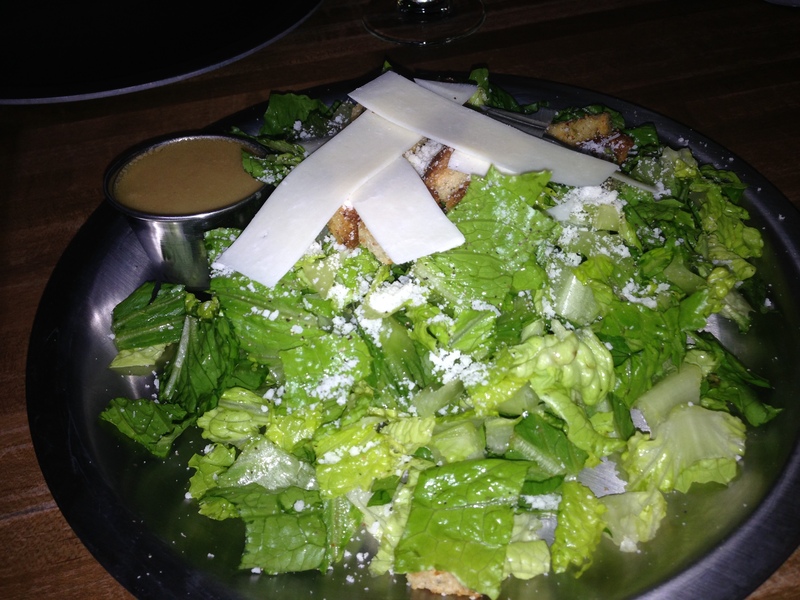 The romaine is crisp and the dressing, which we get on the side is a little bit spicy. The large strips of shaved parmesan on the top are good with the salad. This is a large plate of leaves and can easily be shared. We guess that most people order their entire meal at the same time when they are at the counter. 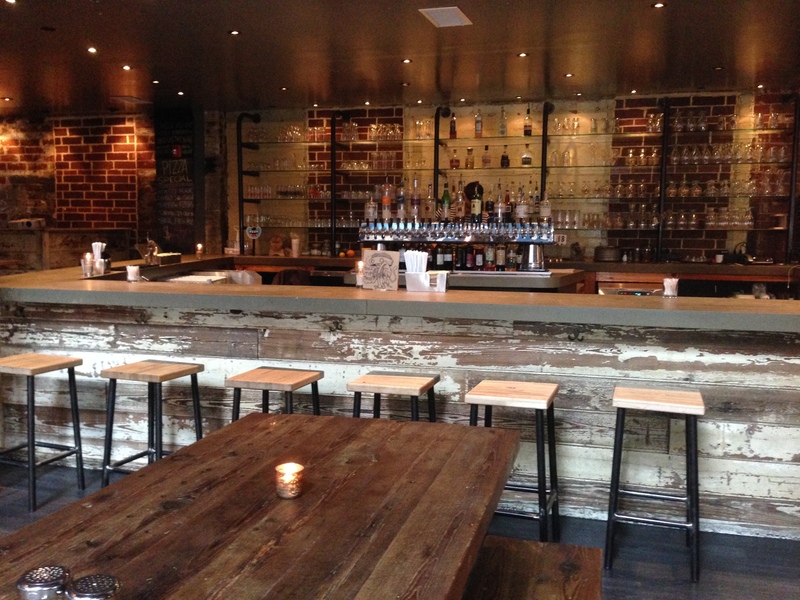 You can bypass the counter and order at the bar in the back, but only if you sit there, and you know there is a bar in the back. Quirky. No matter where you sit, you are on your own for plates, silverware and water, which are all available at a station near the kitchen. I return to the counter for the second time to order “the main event”. Make no mistake about it, these are gen-u-ine Neapolitan-style pizzas, baked in Italian wood-fired ovens. 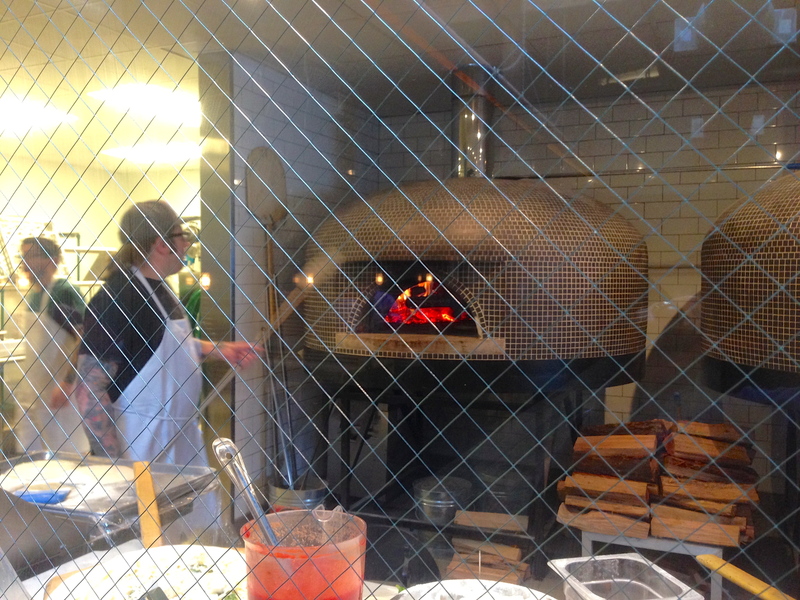 They have two ovens, which cook a pizza in about five minutes. They are throwing the dough and adding the ingredients. Those needing the entertainment can watch them build your pizza behind the glass. 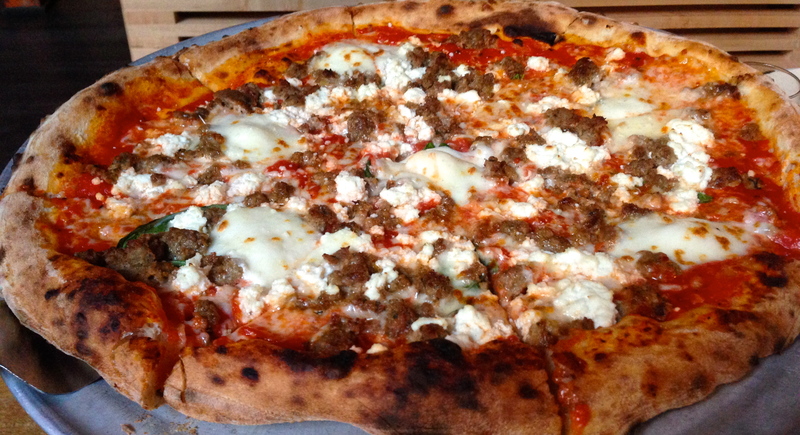 The Bolognese features meatballs, sausage, house-made mozzarella, ricotta and fresh basil. We get the 16″ pizza so that someone (me!) gets to eat the leftovers the next day for lunch. This is excellent pizza. We would have liked it to have been cooked for about 30 seconds more as the mozzarella could have been more melted. Also available on the menu is pizza fritta, which is fried after it’s cooked. Imagine taking a meal as healthy as pizza and frying it! We’ll have to come back and try that another time. Our beers are out and I make my third trip to the counter for a refill. You could never do this at Antico on a Friday night. 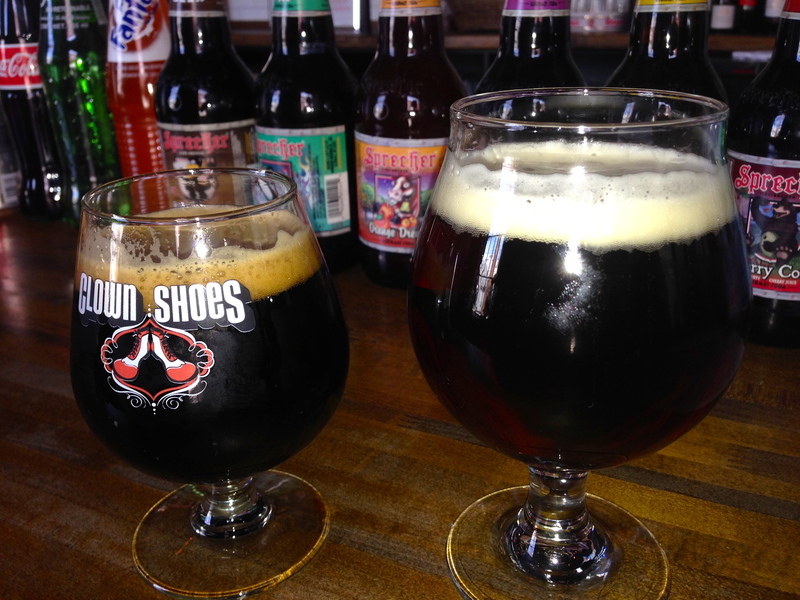 This is the beer I should have ordered before I got distracted by the Clown Shoes. We see a table that has this and have to try it, just because of the glass, which we may have mentioned was not described on the beer list. 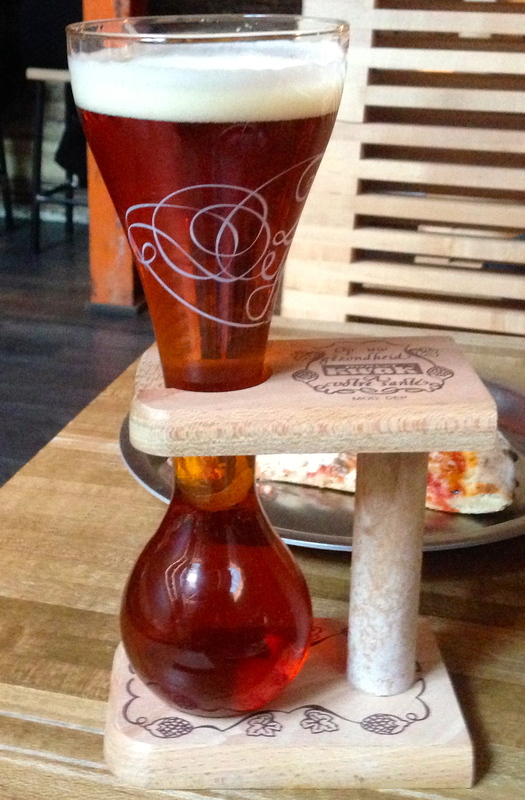 The beer is Kwak, a Belgian Pale Ale. This is a great Belgian beer, and at 8.4% we see why the people at the table across the room from us, who are both on their second one, seem so happy. After all of the heavy pizza, we want something small and sweet. Of course that means my fourth trip to the counter. I am now close, personal friends with the staff there. 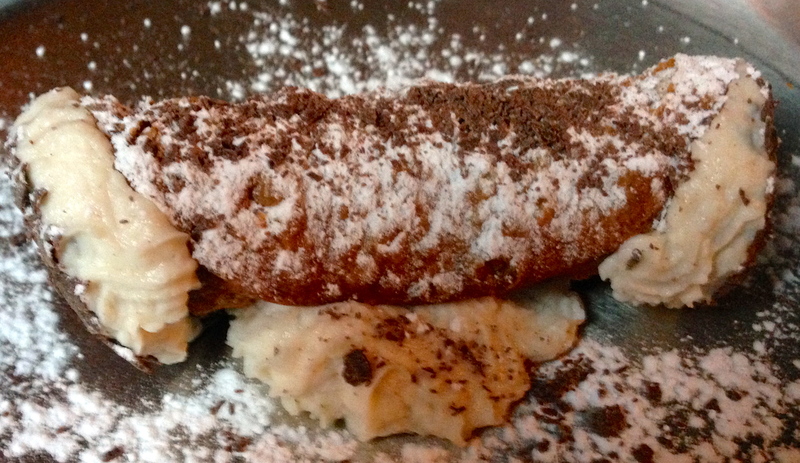 The cannoli is just what we need. It’s a sweet end to an enjoyable meal. As we leave, it has gotten quite crowded. It looks like the best time to go on your date here is before 7PM. 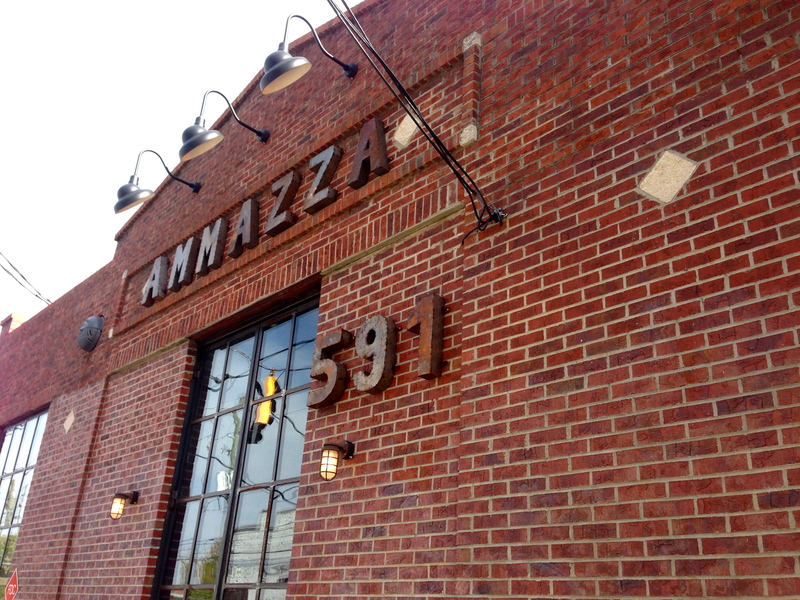 The bottom line on Ammazza: Is it as good as Antico, the Neapolitan pizza king in Atlanta? Almost. Maybe if that mozzarella had been a little more cooked. It’s much easier to get into Ammazza (and much easier to keep going back to the counter) and you can sit at your own table if you wish, unlike the communal tables at Antico. 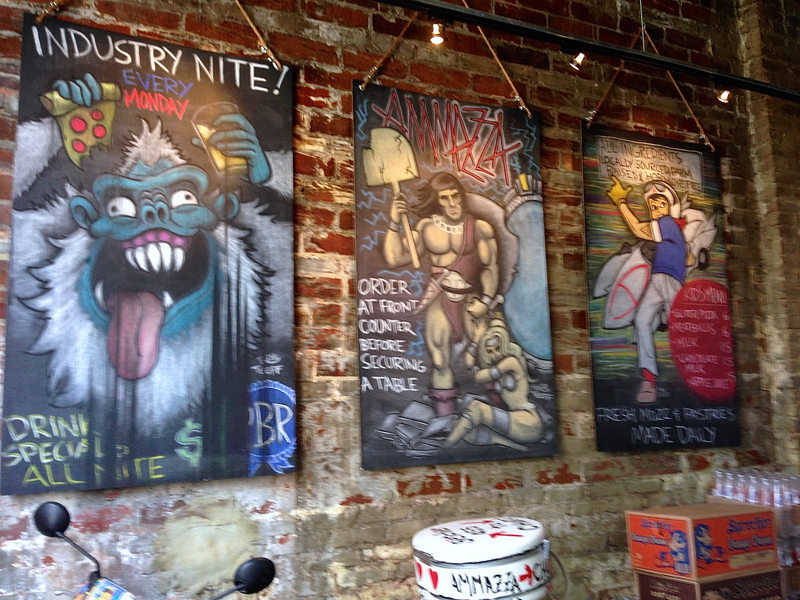 Ammazza has a much better beer list and a cool vibe. If I owned Ammazza, I would ditch the counter and have table service to make it stand out from Antico. 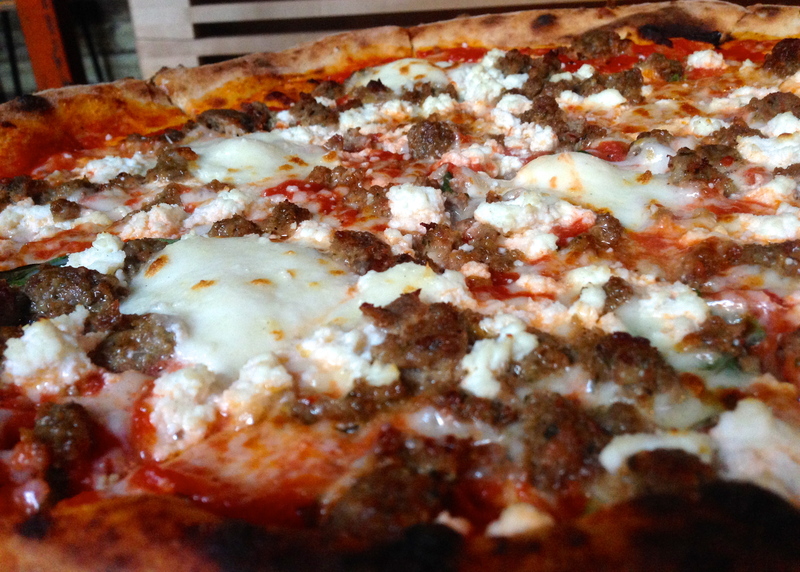 The pizza may not be quite as good as Antico, but we think it’s a delicious alternative, especially if you live in the area and you hate the crowds at Antico.